A leader of a strategic initiative confided to me that she was frustrated with her strategic initiative program’s progress. “How can we quickly execute our strategy in this fog of organizational change in our business environment?” she asked. I explained that the she could unpack the “fog of change” into the four VUCA components. By understanding each component, she could apply strategic thinking and gain traction. Volatility – Volatility refers to the propensity for changing from one state to another. We are all familiar with fog, which is simply water in gaseous form. We use the term volatile for hydrocarbons like gasoline, which can quickly evaporate from liquid to gaseous phases at room temperature (basically, gasoline is boiling off, and we could easily reverse the process by lowering the temperature to condense it from gas back to liquid). Under certain conditions, volatile materials can dangerously explode, changing rapidly from stable to disordered. This provides another implication that volatile conditions are dangerous conditions. Uncertainty – Uncertainty refers to the lack of specific information, which can be found by answering specific questions. Asking “What is the probability that it will rain today?” is a question that is an attempt to characterize uncertainty. Complexity – Complexity refers to the number of components, the relationships between the components. The normal layperson’s usage of the complexity tends to oversimplify the scope of practical problems facing leaders in organizations. 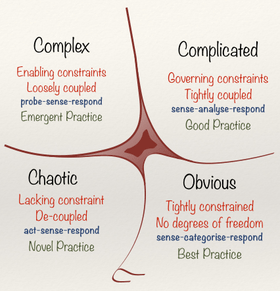 I encourage you to examine Dave Snowden’s Cynefin framework (see nearby image copied from Wikipedia). In that framework, complexity is the relationship between cause and effect. It can only be perceived in retrospect, but not in advance. In this condition, the organization uses an agile approach of probe, sense, and respond. Complexity differs from “complicated.” A complicated issue can be understood by analysis and investigation beforehand. I wrote this article on pathfinding to provide tips for dealing with complexity in strategic initiatives. Ambiguity – The Latin prefix “ambi-“refers to multiple or non-fixed, such as its use in the words ambiance and ambidextrous. Ambiguous language is language that can be interpreted differently. Ambiguity is a cause of stress for many people (especially those who work in well-structured organizations) as the disorder implied by ambiguity is not comfortable. People tend to avoid, ignore, or minimize ambiguity. I wrote this article to provide more understanding on the specifics and contrast of ambiguity and uncertainty. First, detach. Step back from the program and get a sense of what is going on. If you are feeling the stress of urgency for results, put that aside. Strive for a sense of lightness; this program is but one of many things that will define your legacy (and you may discover that what seems so significant now will be unmemorable and unremarkable in a year). Ambiguity, in particular, can be a stressor; don’t let it get the better of you. Second, get a sense of the performance gaps and relationships of all the elements. You don’t need to deep-dive into analysis. Keep the questions you ask high level: Why did the organization select this strategic initiative? Who are the beneficiaries of it? Remember that you are looking at a fog, so keep with that metaphor: where is the fog dense and where is it light? Third, work your way through each of the VUCA elements. As I implied earlier, identifying ambiguity is a good place to start. The fog metaphor and volatility are naturally aligned as fog (water vapor) is simply a dynamic change of phase from liquid to gas (and back again). Fourth, engage your team to help you with this. Lead with questions. I have found that my stress goes down when I realize that VUCA is simply inherent in the situation. My job is to cope, help others, and make progress. I try – as much as I can – to develop perspective that is characterized by maturity and wisdom. I try to see different points of views and be prepared to be surprised. A Final Thought: is VUCA Prime: Helpful or Nonsense? There are a number of authors and bloggers who are now pushing a concept called VUCA Prime. It is a simple and catchy idea, but I believe its simplification is ultimately counterproductive to the challenges of leading a strategic initiative. Ambiguity is replaced by agility. Let’s assume that a military commander (I’m picturing the trench warfare of WWI) peering into the fog, knowing that the enemy lines are out there. This commander has a vision of being victorious, so he orders his troops to attack. His vision of victory doesn’t protect his troops, who are slaughtered by the entrenched enemy. I can make a similar case for complexity and ambiguity. We can pretend they don’t exist, but that doesn’t change reality. Uncertainty (because it deals with answers to explicit questions) can be replaced by understanding. Ask questions and find the answers or estimates. Thus, by my score card, VUCA Prime misses on 3 out of 4 factors. A 25% percent validation is pretty weak! How have you used VUCA concepts? This entry was posted in Competencies of Strategic Initiative Leaders, Incremental Benefits Delivery, Useful Practices & Management Tools and tagged agile, ambiguity, benefits realization, Best Buy, Business, Business model, Business Model Canvas, Competencies of Strategic Initiative Leaders. Bookmark the permalink.